Actually Karen has cobalt blue throughout the house, in a collection of blue glass in the kitchen, a lapis wall in her living room painted by an artist friend and blue art glass in the dining room. Karen is an art buyer for Patagonia. She's been with the company for 31 years and shares both it's penchant for beauty and conservation. 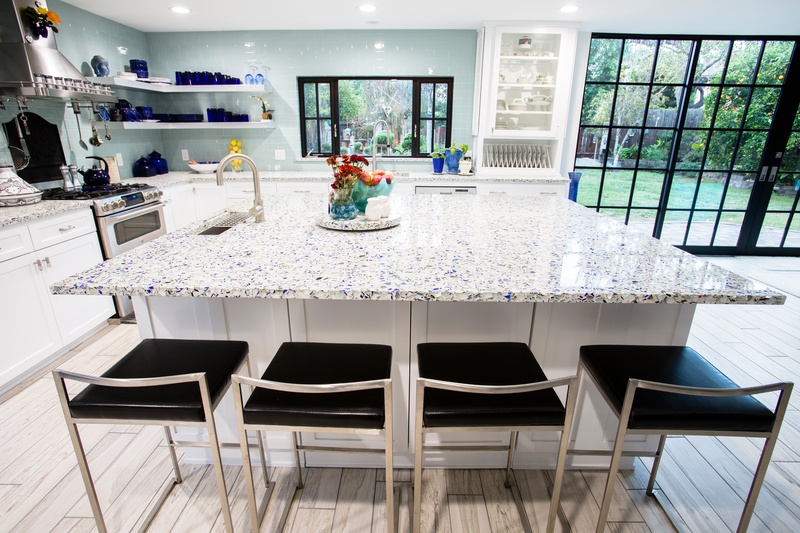 That Vetrazzo is made in the United States with recycled materials and fits her design aesthetic made it a perfect match for her. When Karen got a hold of the material she knew she wanted to use it in as many spaces in her house as possible. 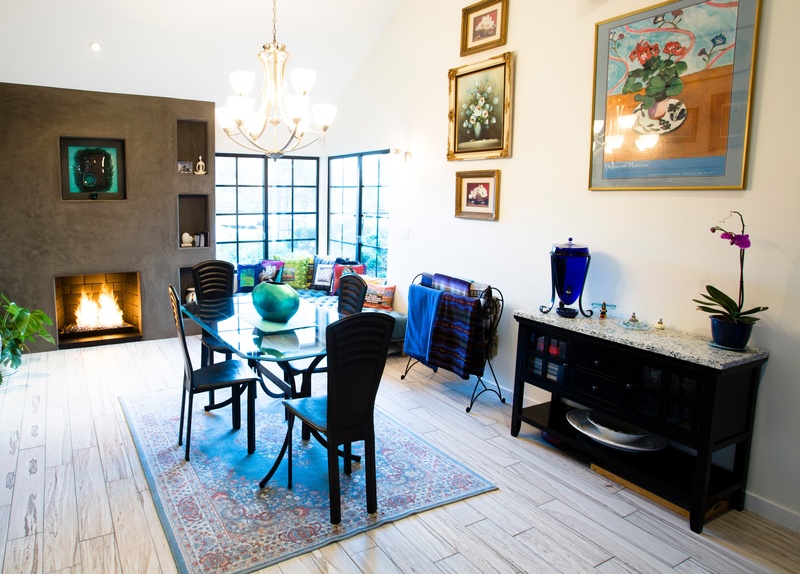 Her fabricator David Askar of Pacific Stoneworks helped her go beyond the island and perimeter countertops to include a window sill in the kitchen and custom topped buffet in the dining room. He even used a remnant of the main sink cutout to create a matching lazy susan, pictured above. Karen's oversized island required two slabs. David laid out his cuts digitally to ensure maximum yield, but it also resulted in a bonus buffet piece and a little piece of custom artwork. "The window sill was planned if we had enough material but the fit was a concern," David said, "At template phase we realized that the sill needed to milled to 1/2" rather than the standard 1-1/4". The buffet in the living room was added at the time of layout when Karen saw how much material was left over. " The digital template from Pacific Stoneworks. 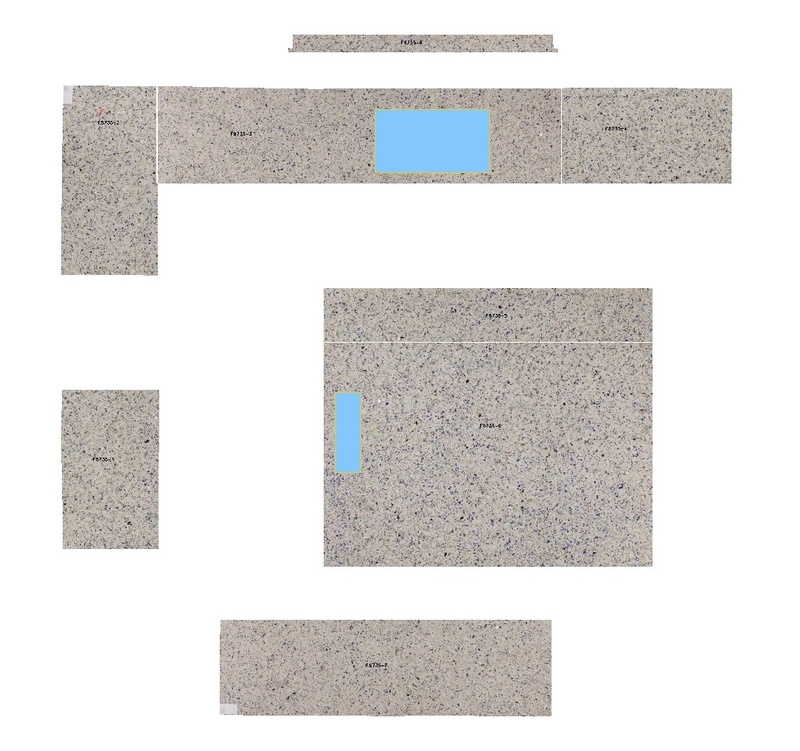 "The digital layout allows us to see how features in material will be when cut and installed. It's great for material yield and setting expectations prior to cutting," David said. There was a tiny piece of material leftover, but David made good use of it. 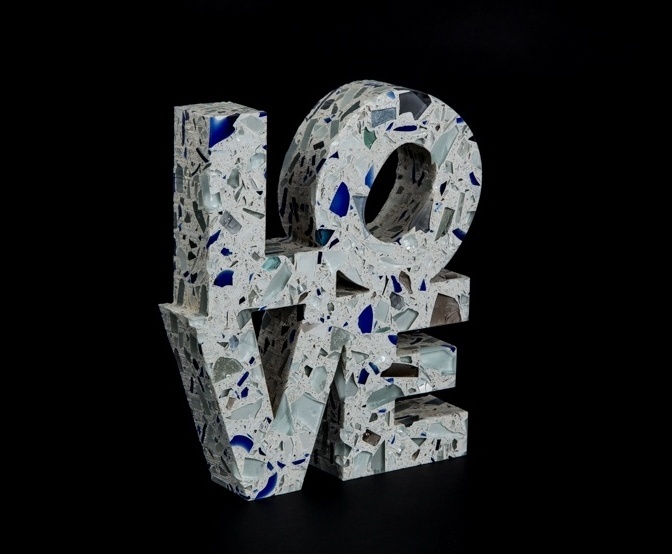 Modeled after marble pieces in his showroom David fabricated two graphic art pieces for the couple, LOVE and HOPE. Seeing the fabrication process, which is usually done behind the scenes on HGTV shows, was instructive for Karen. "When we first started working together I said, 'What do you mean 'the fabrication'? Why does this cost money?' Then I saw the diamond saw and the polishing. I didn’t understand that before."  Pacific Stoneworks are certified Vetrazzo fabricators who work with the material frequently and have honed their skills in cutting, polishing and installing Vetrazzo. "I learned a lot from them. They're amazing fabricators," she said. 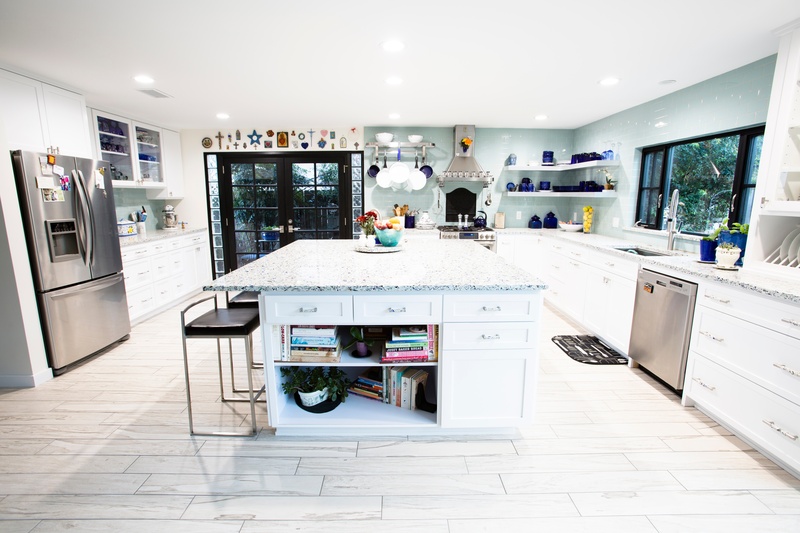 The oversized island was designed with deep open shelving originally to accommodate dog beds. The main feature of the Chivalry blue color mix is its signature cobalt blue glass pieces and large aggregate size. Though every slab of Vetrazzo is unique, even within the color mix. Bednorz chose her specific slabs from Pacific Stoneworks for their individual color character. "More than just the cobalt, they had all the colors I wanted, deep peacock, sea foam green, all the colors that call to me and calm me. When I’m sitting at the breakfast bar with sun coming in it sparkles,"
The kitchen is her own design in collaboration with Damon Webb Construction. When she retires from Patagonia she hopes to launch a second career as an interior designer. Bednorz' was inspired to include black windows and doors into her design from an idyllic trip to Italy where they stayed in an old apartment. "It had floor to ceiling steel french windows. I fell in love with them. I fell in love with our trip and these doors are something that remind me of our trip to Rome." 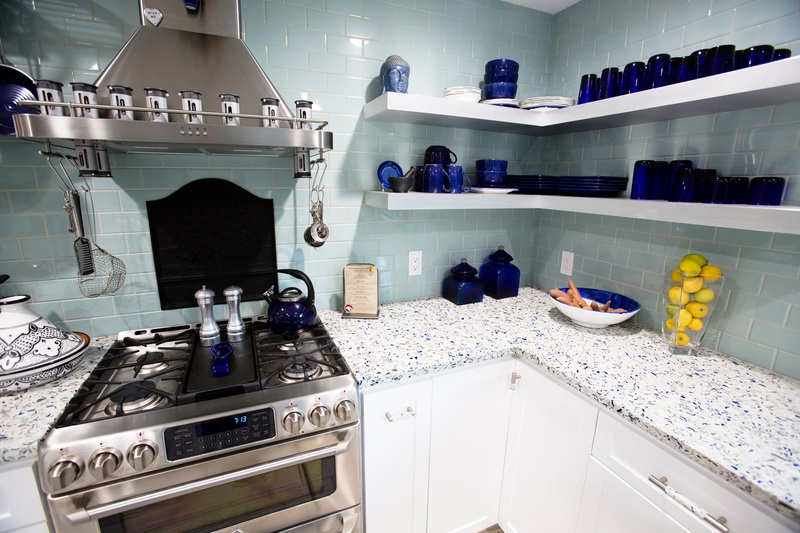 The hardware comes in pulls and knobs of various styles and finishes in a variety of Vetrazzo color mixes. Karen who describes herself as "very particular" was intent on carrying the theme of cobalt glass set against white throughout the kitchen. 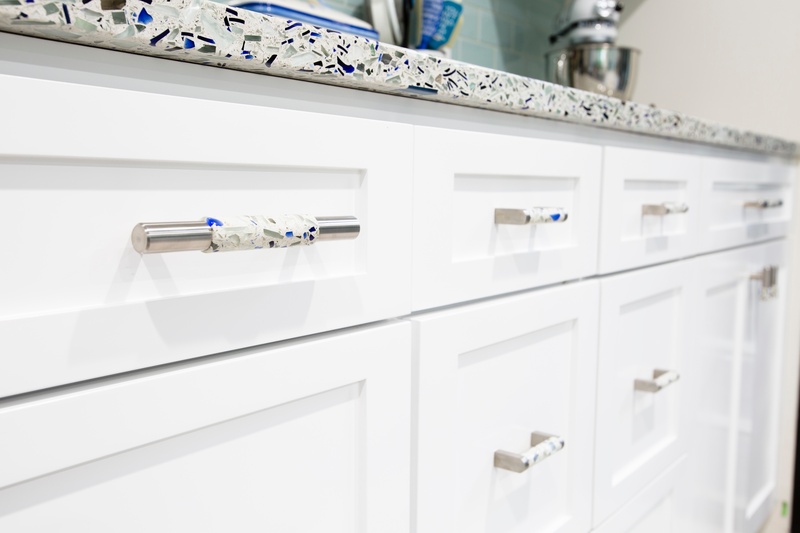 She found her solution in Vetrazzo's recycled glass hardware in matching Chivalry Blue. Click here to learn more about hardware. Karen's cobalt glass collection just happens to match her countertops perfectly, because as she says, "I like everything just so." Karen's attention to detail carries over to how she cares for her kitchen. Though the recycled glass counters are made from durable cement, Karen cleans them carefully with a soft cloth and granite cleaner. "It's the only thing I want to use on my countertops. I baby them somewhat," she said. "I like to take care of my things. It’s taken me a long to get here and I want it nice." 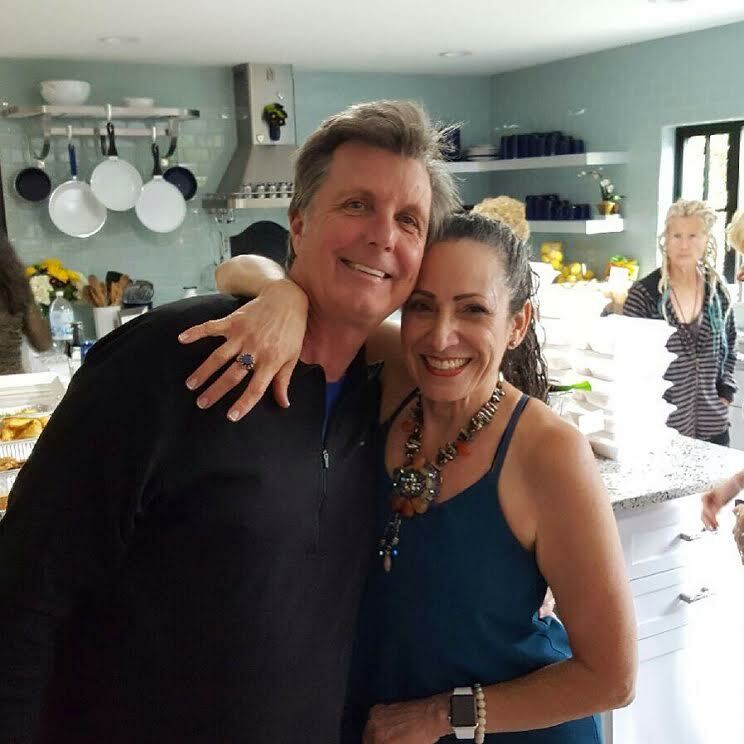 Gary and Karen Bednorz celebrating his 60th birthday in their new kitchen. Combining beautiful well cared for pieces in her (she really does use those white pots everyday) is a bit of a signature for Karen. She and Gary like to fill their home with friends to enjoy the space. And even contractors who come to do work stop and take pictures of the countertops to share with their wives, which Karen said, makes her feel great. "This is my jewelry, my husband never has to buy me a diamond again." 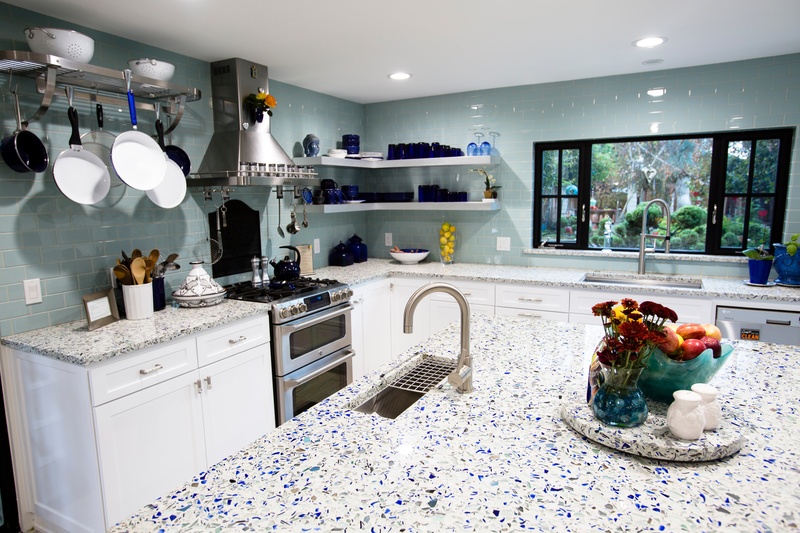 See and touch recycled glass countertops. Order a sample in your color choice here. Member of the trade? Click here to request one.